Are you the type who runs to the back of a store and checks out the clearance & sales before scanning the rest of the place? There's nothing wrong with that! You can do this on TheFireStore's site and virtually go "to the back of the store" by clicking our on our Clearance section and seeing the hot deals. Clearance should never be overlooked---you never know if exactly what you're looking for is hiding in there. 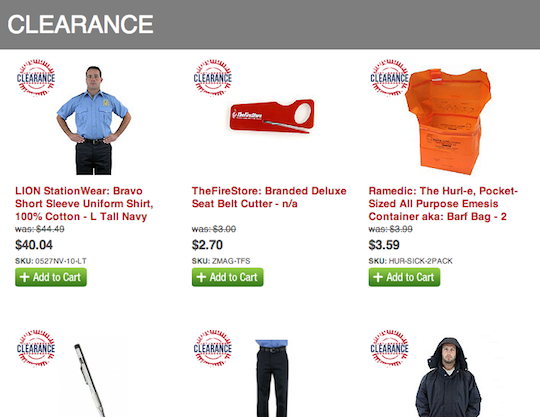 Right now the clearance section is packed with 5.11 Station Pants, LION Jackets, Boots, rescue tools, Flex-Fit Hats, Meret Bags, POWERDECALS, Camelbak Water bottles, knives, helmet bands, gloves, OtterBoxes, jobshirts, Wildland Gear and MORE. It is no joke, folks! So make sure you take a few minutes to cruise through the Clearance, today, to see if you can snag a deal!